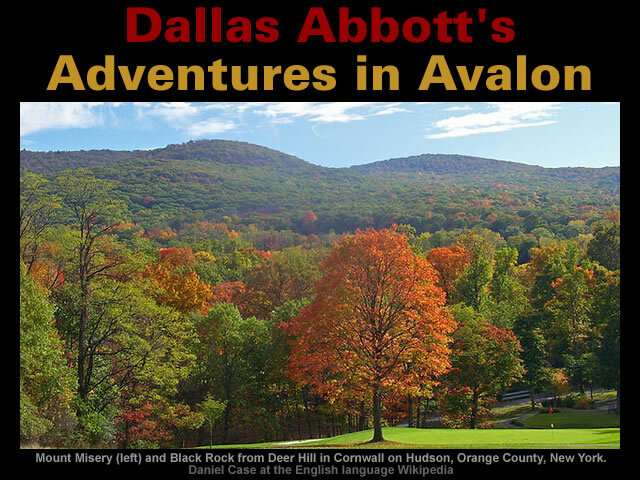 Dallas Abbott’s adventures at the Atlantis Conference in 2005 appear to have been a natural pre-cursor to her subsequent Adventures in Avalon which began in the Black Rock Forest. Black Rock Forest is a 3,870-acre (15.7 km2 forest and biological field station maintained by Black Rock Forest Consortium. It is located in the western Hudson Highlands region of the U.S. state of New York, in Orange County, mostly in the town of Cornwall, with the southern fringe overlapping into the neighboring town of Highlands. First established by a local resident in 1928, the forest was the property of Harvard University until 1989. Over 400 papers have been published from research done in the forest. Cornwall is a town in Orange County, New York, United States. As of the 2010 census, the population was at 12,646. Located about 50 miles north of New York City on the western shore of the Hudson River, Cornwall has become a bedroom community for New York City. These adventures begin in 2006 with a core from Tamarack Pond in the Black Rock Forest. In 2006, we used a piston corer to take a core from Tamarack Pond in Black Rock Forest near Cornwall, NY. Tamarack Pond is an artificial lake that was a bog until about 100 years ago. Approximately I km away, an earlier core from Sutherland Pond is known to have a sedimentation rate of about 100 cm per thousand years. We are interested in determin ing if Tamarack Pond also had a similar sedimentation rate and geological history. Exotic Grains in a Core from Cornwall, NY – Do They Have an Impact Source? The Tamarack Pond core contained seven discrete layers with six of these layers being “difficult to explain except through impact processes”. We have found seven discrete layers in a bog core from Cornwall, NY about 80 km away from the Atlantic Ocean. All but two layers contain material that is unlikely to be locally derived. In most cases, the material in the layers has been transported thousands of kilometers from its source area. Six out of the seven layers are difficult to explain except through impact processes. Layer A from the Tamarack Pond core is particularly intriguing because it’s deemed to have been deposited around 1006 ± 67 A.D. i.e. close to the Heinsohn Horizon in about 912 CE. Layer A. 350-355 cm. Corrected 14C Age: 1006 ± 67 A.D. This layer contains four grains that appear either distally transported and/or impact related. The first is a fresh basaltic glass shard with no vesicles. The nearest source of basaltic glass from recent volcanism is either along the mid-Atlantic spreading ridge (2800 km away) or in the western United States (3700 away). The nearest Caribbean volcano is 2600 km away but Caribbean volcanic glass is generally more silicic than basalt. Based upon the dating of Layer A the historic records were searched for Atlantic tsunamis [between 939 AD and 1073 AD] that might be linked to an impact event. This search revealed two broadly dated tsunami events from Curacao [in the Lesser Antilles] and some very specific [but suspect] tsunami events for 1014 AD from the United Kingdom. A widespread flood was reported in the Anglo-Saxon Chronicle to have occurred in western Britain, from the coast of Cumbria to Kent, on 28 September 1014. The event was also mentioned in Welsh bardic chronicles. On the 28th September 1014 ◦Accounts suggest that a flood affected Kent, Sussex, Hampshire, Cumbria, and Mount’s Bay in Cornwall, where the Bay was “inundated by a ‘mickle seaflood’ when many towns and people were drowned”. This year, on the eve of St. Michael’s day, came the great sea-flood, which spread wide over this land, and ran so far up as it never did before, overwhelming many towns, and an innumerable multitude of people. The Anglo-Saxon Chronicle is a collection of annals in Old English chronicling the history of the Anglo-Saxons. All of the surviving manuscripts are copies, so it is not known for certain where or when the first version of the Chronicle was composed. As with any historical source, the Chronicle has to be treated with some caution. The dating of the events recorded also requires care. In addition to dates that are simply inaccurate, scribes occasionally made mistakes that caused further errors. Remarkably, the material of marine origin found in Layer A could only have come from three sites [white dots on the map below] in the North Atlantic. Glauconite casts form exclusively in the marine environment, either within marine microfossils or as a replacement of faecal pellets. The radiolarian is also of marine origin and is most probably from 40° to 50° N or an upwelling region in the North Atlantic. If we look for marine sediments in the Atlantic that contain both glauconite and radiolarians, are between 40° and 50° N, and are close to a mid-ocean ridge, there are only three sites with the correct sedimentary assemblage and geographic location. The northern most of these three sites site was eliminated because it was thought it wouldn’t produce a tsunami in the English Channel. 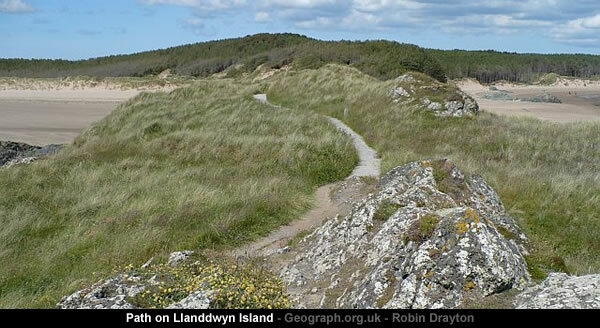 However, it’s suggested the other two Atlantic sites could have produced a tsunami in the English Channel and there is a [very remote] possibility they might be associated with wave impact events in North West Wales. 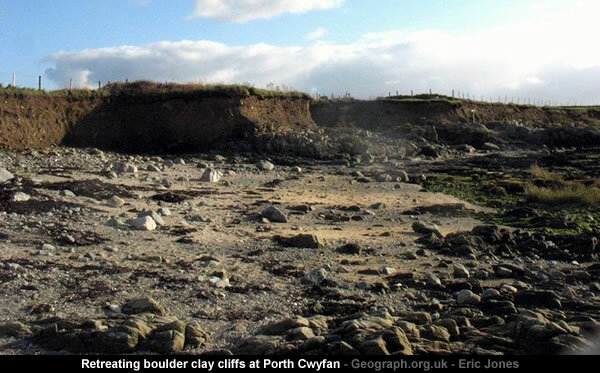 Field investigations in North Wales on Anglesey and the Lleyn Peninsula have identified four sites where imbricated boulder trains occur that are discriminators of wave characteristics. Clast analysis indicates that storm wave heights (ca. 20 m), in excess of known extremes (5 to < 9 m), are required to transport them. c) impact of comet debris in the North Atlantic, with a candidate event around AD 1014. The decision to eliminate the northern most site is very strange because Dallas Abbott’s Beach Chevron paper from 2008 shows a powerful tsunami from the West impacted [the other] Cornwall in the United Kingdom. Porth Nanven (also locally known as Penanwell and occasionally as Cot Valley Beach) is a beach in the far west of Cornwall, United Kingdom. Porth Nanven has sometimes been referred to as ‘Dinosaur Egg Beach’ in the media because of a remarkable deposit of ovoid boulders covering the beach and foreshore. 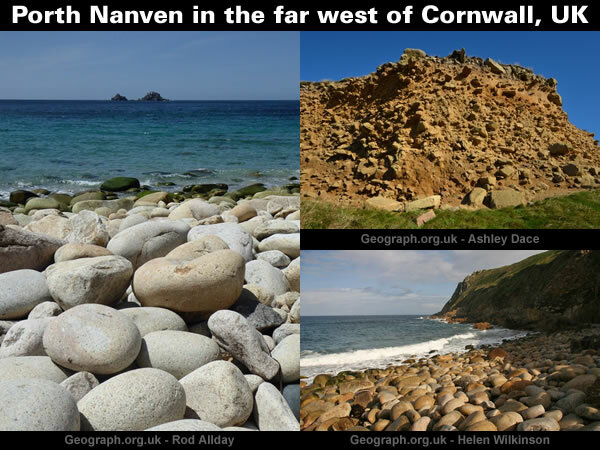 These boulders come in all sizes, from hen’s egg to a metre or more in length, and have proved so tempting as souvenirs that they are now legally protected by the National Trust which owns the beach. 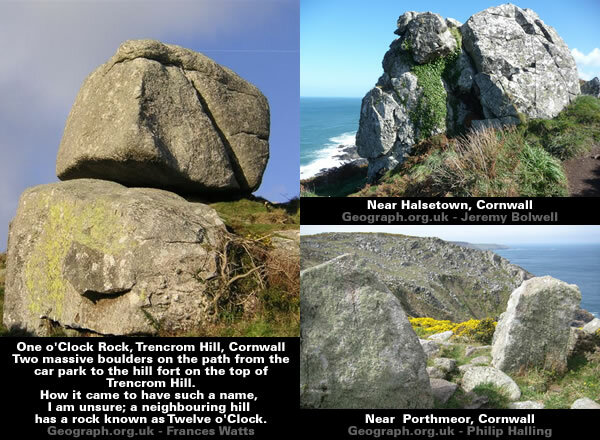 The Logan Rock (Cornish: Men Omborth, meaning balanced stone) near the village of Treen in Cornwall, England, UK, is an example of a logan or rocking stone. Although it weighs some 80 tons, it was dislodged in 1824 by a group of British seamen, intent on showing what the Navy could do. However following complaints from local residents for whom the rock had become a tourist attraction and source of income, the seamen were forced to restore it. The South West Coast Path, which follows the coast of south-west England from Somerset to Dorset passes by on the cliffs to the north. In fact, the evidence from Cornwall in the United Kingdom points directly towards the northern most candidate site [in the Atlantic] and the [now submerged] location of Avalon/Atlantis. Gallery | This entry was posted in Astrophysics, Catastrophism, Dallas Abbott, Geology, Heinsohn Horizon, History, Varves. Bookmark the permalink.